Looking to buy or replace your home’s overhead door? Welcome to Environmental Door, located in Grand Rapids, MI. Our team prides itself in offering the highest quality products and top‑notch service to all of our customers. We specialize in selling, installing and repairing all makes of garage doors and garage door openers. When looking for a residential, commercial, industrial or agricultural garage door, our experts will help you choose the best system for your project. At Environmental Door, we promise timely and courteous service in all areas of installation, repair and maintenance for your overhead door system. Learn more about our 26‑point garage door "tune‑up". We serve: Grand Rapids, Ada, Allendale, Byron Center, Caledonia, Comstock Park, Coopersville, Cutlerville, Grandville, Grand Haven, Holland, Hudsonville, Kentwood, Muskegon, Ottawa County, Rockford, Sparta, Walker, West Michigan and Zeeland. There are two types of garage door openers. One uses a chain drive (like on a bicycle), the other uses a belt drive (metal‑reinforced rubber). We recommend both types of garage door openers since both offer great performance. It’s important to note that the chain drive does require lubricating twice a year to maintain it properly. 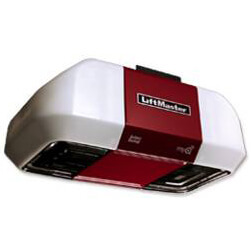 At Environmental Door, we install garage door openers made by LiftMaster. In our experience, they are the most reliable and durable. With time, minor issues may arise with your opener. Most often, they are due to maintenance issues, such as an obstruction or misalignment in the reversing system’s infrared beam. Another common issue is low battery power in one of the control panels. One of our team members can troubleshoot the problem and fix it promptly to get your overhead door opener working like new again. 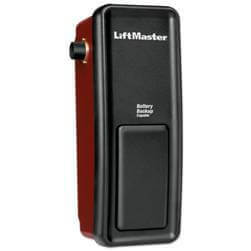 One of the key features of your overhead door opener is the automatic reverse mechanism. There are two important safety mechanisms that ensure everyone’s well‑being around your garage door. The first mechanism is an infrared beam that is projected across the door’s opening. If the beam is broken as the door is lowering, the door reverses itself automatically. The second safety feature is mechanical. If the sensor located on the bottom of the door comes into contact with a person or object, the door will also reverse. It’s important that both automatic reverse mechanisms are always in good working order to prevent an injury. Don’t forget that an opener is quite powerful – if it can lift a 225‑lb overhead door, it could also push that same amount of weight to the ground. Another important consideration is having a garage door opener with appropriate safety accessories. Backup battery power, for example, would be helpful in a power outage. Without it, your opener would not work and you would need to use the manual release handle located inside your garage to open or close your overhead door. For all of your garage door and garage door opener needs, contact Environmental Door Our team of experts services the Grand Rapids, MI area. Our technicians can come to your home to make sure your overhead door system is in great working order. We can also conduct an inspection as part of an annual preventative maintenance program, where our specialists will examine your overhead door and identify and perform any needed repairs or maintenance. We want your door to work smoothly and safely, and last you for many years to come! Please contact us today to schedule an appointment at 616-453-0164!